I love the whimsy behind metal jewelry with inspiration stamped on it. “Dream” and “wish” and “believe” and some other encouraging words, and short Bible verses (or portions of verses, such as “Be still”), are always popular choices for metal stamping meaningful jewelry, reminding us to slow down, relax, leap, let go. Metal stamping is such an easy, effective way to add personality and sentiment to your handcrafted jewelry. A few years ago, I ordered a sterling silver guitar-pick blank from Beaducation for my cousin’s son for Christmas. He’s an awesome musician and a super sweet boy, so I knew he’d appreciate the sentiment of having his initials stamped on one side and those of his dad (my beloved cousin, who had died a few years before) on the other side. It was a big hit with the whole family, and I know it brings him happiness whenever he uses it. I love hearing him play, and I hope it reminds him to never stop making music. If you’re new to metal stamping, you can learn how to make stamped metal jewelry with this fun little stamped-jewelry tutorial by Sara Richardson, a frequent contributor to Jewelry Making Daily and Step-by-Step Wire Jewelry magazine. Sara took a guitar class with a great group of people and wanted to make them all a personalized, meaningful (and practical) piece of guitar-pick jewelry. Here’s how she did it. I wanted to attach a guitar pick to a chain, so if these nice people ever needed a pick all they needed to do was look around their neck. But how could I add that personal touch? 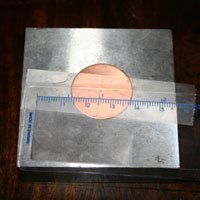 I had several sterling, copper, and brass blanks lying around my work table. I stamped the words “Guitar Guru” on one of them (for my teacher). I punched holes on the top and bottom. Then, with jump rings, I attached it first to the chain. I also punched a hole on the top of the guitar pick and attached it to the stamped element with more jump rings. I felt I had created the perfect gift! First, to prevent the blank from moving around during hammering, you can tape it down with a bit of Scotch tape. Of course, it is important to hammer on a hard, stable surface. Also, to ensure you stamp in a straight line, you can tape a small, flexible ruler onto the blank with Scotch tape. Don’t worry if you stamp over the tape. You can easily take it off later. Second, make sure you hold the metal stamp with the notch against your thumb. That way, it won’t stamp upside down (among other problems). Hammer directly on top of the metal stamp at least five or six times. If the letter or design didn’t completely transfer, just slide the stamp back into the notch you created (you should feel it easily) and hammer it a few more times. 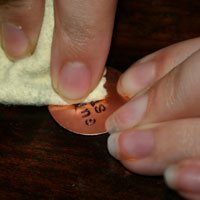 Metal Stamping Tip: Put the stamps back after you’re done using them. A lot of the letters look similar, especially when upside down and backwards. And more than once I have chosen the wrong stamp, resulting in ruined pieces. Since I started following this rule, the mistakes have drastically decreased. If you want to darken in the letters, it’s very easy. All you need is a thin black Sharpie marker and a polishing cloth. Trace in the stamped letters as best you can. After you’re done, just wipe it off with the cloth. It’ll take away any small mistakes and will help the marker settle into the stamped parts. As you can see, it only takes a few minutes to make personalized jewelry for your family, friends, and other important people in your life! Master metal stamping jewelry with these expert resources!